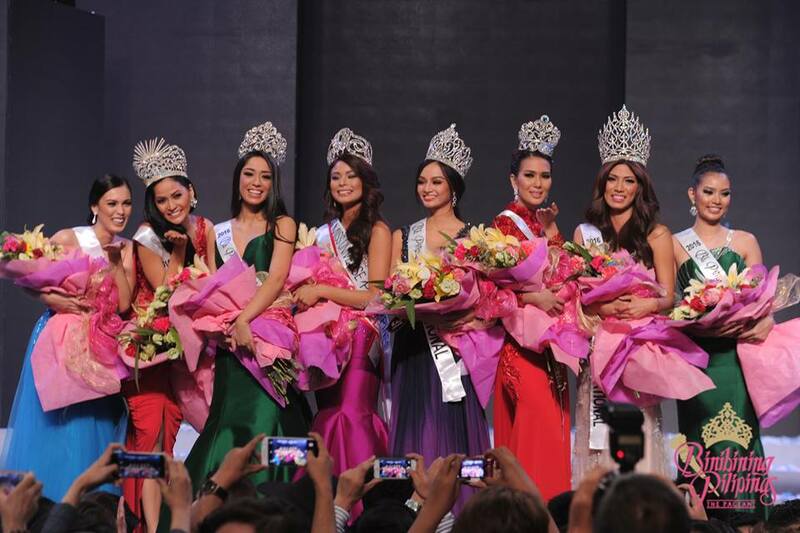 MANILA, Philippines - The results are in and the complete list of winners for the country’s most prestigious beauty pageant, Binibining Pilipinas 2016 was officially announced during the grand coronation night on Sunday, April 17 at the Smart Araneta Coliseum. Maxine Medina wins Miss Universe Philippines 2016 crown. Forty contestants showed their best vying for the six crowns at stake: Miss Universe, Miss International, and other international pageants such as Miss Supranational, Miss Intercontinental, Miss Globe and Miss Grand International. Pia Wurtzbach (Miss Universe 2015), Janicel Lubina (Miss International 2015 Top 10 Finalist), Rogelie Catacutan (Miss Supranational 2015 Top 20 Semi-Finalist), Christi McGarry (Miss Intercontinental 2015 1st Runner-up), Ann Lorraine Colis (Miss Globe 2015), and Parul Shah (Miss Grand International 2015 3rd Runner-up) crowned their successors at the end of the event. Best in National Costume - #3 Angela Fernando. Miss Friendship and Miss Talent - #16 Vina Openiano. The coronation night was hosted by Kapamilya stars Xian Lim and KC Concepcion. Part of the panel of judges are Paolo Roxas, Lauren Dyogi, Ian Veneracion, and Cory Vidanes. Joining them are Ambassadors Igor Anatolyevich Khovaev (Russia), Roland Van Remoortele (Belgium), Jan Top Christensed (Denmark), as well as former ambassador Lani Bernardo. Also on the panel are Miss USA Olivia Jordan, Secretary Adrian Cristobal Jr., BPCI Executive Commissioner Betsy Westendorp, and BPCI Chair Stella Marquez Araneta. Did your favorite candidate win? Let us know in the comment section below.